The principles and experiences described in this book played an important role to make SOA at T-Mobile a success story with more than 10 million service calls per day. In an industry rife with acronyms, SOA manages to be the most misunderstood--and at the same time holds the greatest promise. This down-to-earth book enlightens planners & practitioners on the promise, and clarifies the business value of the SOA business strategy. The book belongs in the hands of every CIO, IT Director and IT planning manager. 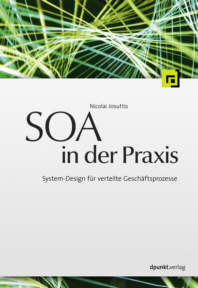 Nicolai Josuttis has produced something that is rare in the over-hyped world of SOA; a thoughtful work with deep insights based on hands-on experiences. This book is a significant milestone in promoting practical disciplines for all SOA practitioners.